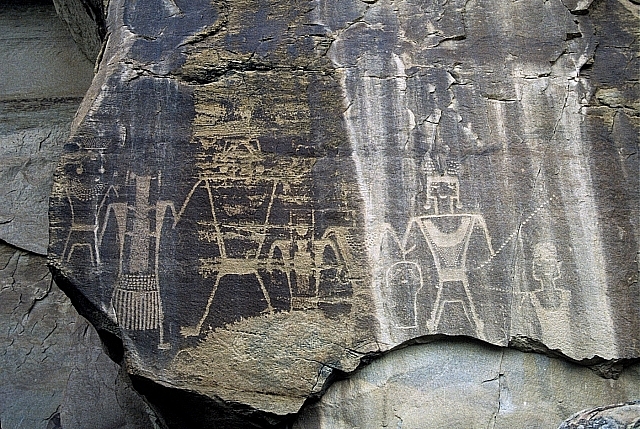 Fremont anthropomorphic petroglyphs, McConkie Ranch, Vernal, Utah. Photo Credit: Kelley Hays-Gilpin, Museum of Northern Arizona and Northern Arizona University. The presence of the Fremont culture in the Southwest was limited to the northern reaches of the Colorado Plateau during the period between A.D. 700 and A.D. 1250. Perhaps best known for their distinctive rock art depicting trapezoidal human figures with elaborate necklaces, the Fremont culture also produced a basketry style, a particular style of footwear, and thin gray pottery distinctly their own. However, like their southern neighbors, the Fremont people practiced a mix of foraging and agriculture, but were perhaps less reliant on the latter. And as with many of the other cultures of the Southwest, traces of the Fremont people disappeared from the archaeological record after A.D. 1250.